This Deskbook is invaluable for its exploration of cases in which existing copyright content is being aggregated, adapted, and distributed in ways unforeseen by Congress when it passed the Copyright Act in 1976. The treatise offers the most up-to-date and significant aspects of the law, including fair use, work for hire, copyrightability, digital rights and the DMCA, international considerations, damages, formalities, preemption, and litigation issues. 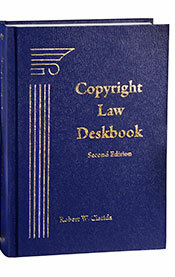 The Second Edition include jurisdiction and procedure: U.S. jurisdiction over acts of foreign infringement; personal jurisdiction based on a defendant’s internet activities; copyrightability: new decisions on the copyrightability of derivative works, real estate information, financial data, lighting fixtures, toys, the Visual Artists Rights Act, and cars as copyrightable “characters” in movies; and fair use: newest arguments in transformative technological use, both successful and not, including the digitization of library books; music file-sharing, and online “space shifting” of music files; fair use and Harry Potter reference books; and more.